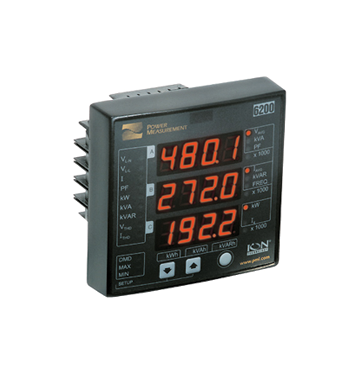 The PowerLogic ION6200 meter is an ultra-compact meter that offers outstanding quality, versatility and functionality in a low cost, flexible meter. An ideal replacement for multiple analog meters, the PowerLogic ION6200’s modularity allows genset and electrical equipment manufacturers, panel shops, EMS manufacturers and energy service providers to reduce inventory requirements by stocking inexpensive components and building specific meter configurations as needed, rather than carrying a large inventory of pre-configured meters. The meter is suitable for myriad applications such as substation monitoring, revenue metering/sub-metering and cost allocation and is an excellent fit for both energy providers and energy consumers. It offers an excellent upgrade path, allowing you to start with a low cost base model and add new features and capabilities as requirements evolve. It can be integrated with our ION® EEM enterprise energy management software, ION Enterprise® operations software or other automation or SCADA system.